The Haemorrhois – “bleeder” or “blood-letter” – is one of the many Saharan snakes feared for its venom. True to its name, it produces a violent hemotoxin that forces its victims’ blood out of their bodies. Topsell seemed uncertain as to whether it was an asp or a viper, but its appearance and effect of its venom strongly imply a viper. Descriptions of the haemorrhois consistently agree that it is one foot long and has horns of some sort. 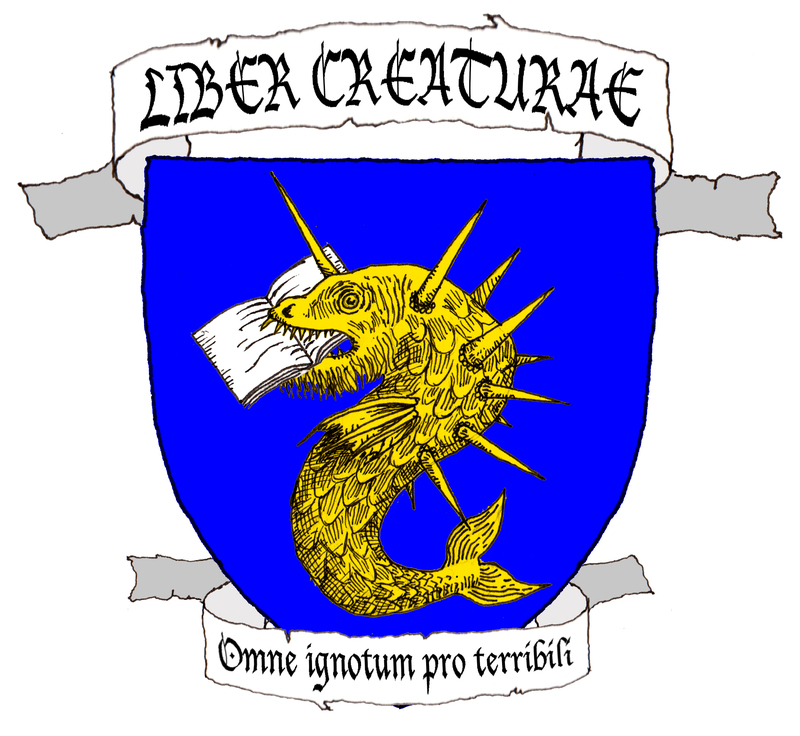 Aelian gave it bristling horns, but Aldrovandi sets the number to one. It is pitch black or fiery in color, with bright eyes; Topsell believed it to be sandy yellow with black spots. The head is broad, tapering to a short, pointed tail. 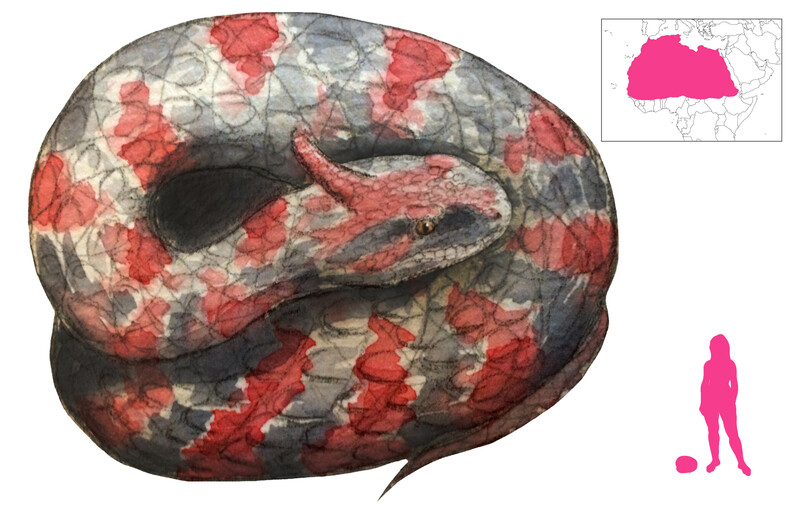 The scales of a haemorrhois are rough and make a rustling sound as the snake moves, suggesting that it may have been inspired in part by the saw-scaled viper. They are slow and sluggish animals, and make winding nests in rocky areas. Sexual dimorphism is known. Males tend to hold their head up when traveling, while females remain close to the ground. Aelian adds that the venom of female haemorrhois specifically targets the gums and fingernails. Envenomation by a haemorrhois is particularly gruesome. As the venom spreads, blood begins to leave by every opening possible, draining out through the eyes, ears, nostrils, mouth, even the very pores. Scars reopen. Teeth and nails fall out. The entire body becomes one bleeding wound, and death comes through catastrophic blood loss. Lucan, in describing the fate of young Tullus, compared the dying Roman to a statue gushing water, weeping and sweating blood. One of these snakes was encountered by Menelaus and his men in Egypt. Helen crushed it and extracted its poison for reasons unknown. Since then, all haemorrhois have been slow creepers. Topsell recommends a number of substances as antidotes to haemorrhois bite. These cures include vine-leaves with honey; powdered haemorrhois head taken with water; garlic with fleur-de-lis oil as an emetic; and raisins. To staunch the bleeding, plasters made of vine leaves and honey or purslane and barley leaves should be applied, and the wound washed with cold water. Finally, he concedes that the same remedies used for other snakes may prove effective. Hard eggs with salted fish, or a potion of radish seeds, poppy juice, lily roots, daffodil, rue, trefoil, cinnamon, cassia, and sweet myrrh can help. Aelian, trans. Scholfield, A. F. (1959) On the Characteristics of Animals, vol. III. Harvard University Press, Cambridge, Massachusetts. Aldrovandi, U. (1640) Serpentum, et Draconum Historiae. Antonij Bernie, Bologna. Batinski, E. (1992) Cato and the Battle with the Serpents. Syllecta Classica, Vol. 3, pp. 71-80. Eldred, K. O. (2000) Poetry in Motion: the Snakes of Lucan. Helios 27.1, p. 63. Isidore of Seville, trans. Barney, S. A.; Lewis, W. J.; Beach, J. A.; and Berghof, O. (2006) The Etymologies of Isidore of Seville. Cambridge University Press, Cambridge. Lucan, trans. Rowe, N. (1720) Pharsalia. T. Johnson, London. Topsell, E. (1658) The History of Serpents. E. Cotes, London.